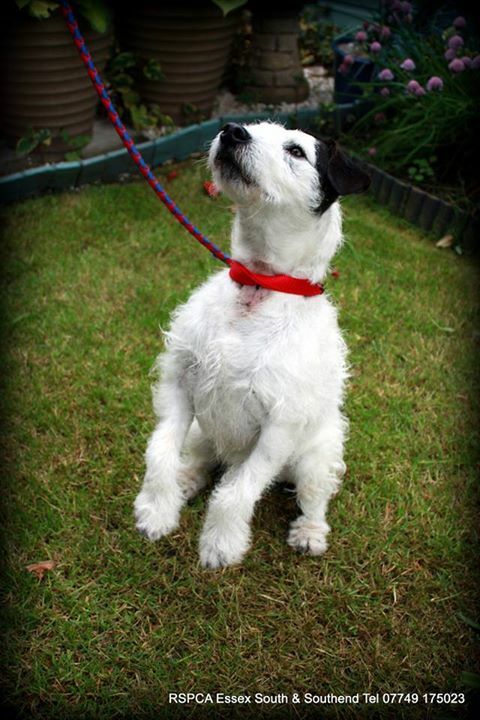 Hello, my name is Sparky, and I am a nine year old male Terrier. I am in kennels waiting for a home because my owner died, and although family members were supposed to come and take me home, they never arrived. I would like a retirement ho...me where I can just be myself, I enjoy playing ball and fetch, and I can play beg for treats. But I do not always like being touched, especially on my back, so I need a new owner who understands that, because I will tell you off if you forget and try to pet me there! I don't have any pain now, but when I came in to kennels my collar was very tight and my skin was sore and bald, so maybe it's because I had pain in the past that I don't like being touched there now. I know its hard because I am so cute looking, but I really am happy not to be cuddled, we can play ball instead, and I can lie at your feet and keep you company. I am a good boy in the house, the kennel staff sometimes take me home for a little break and I behave well. Although it's fine here in kennels, I really am a bit too old to stay here much longer, and would like a comfy bed of my own in a forever home. If you'd like to come and meet me call 07749 175023.